After more than two years of research and development, we, Rick and Kris Roberts along with the help and support of our three sons, Austin, Tristin and Jorgen, opened our first drive-through coffee shop on July 14, 1997. Our original location was located in a Long’s Drugs store parking lot on the corner of Myrtle and West Streets in Eureka, California. 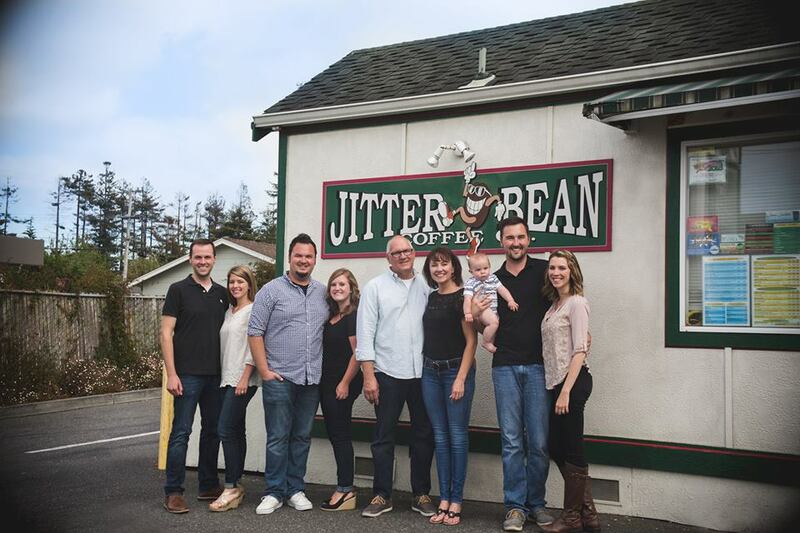 Since that time, we have opened four more locations in Humboldt county and in 2007, we established Jitter Bean Specialty Coffee Roasters to provide our own, freshly brewed coffee to our business, as well as to provide wholesale to several other businesses. The focus of the Jitter Bean Coffee Company, after establishing a good location, was to provide an excellent product with the highest quality of service possible. Using that simple philosophy, the Jitter Bean has become one of the best coffee/espresso businesses in the area. While local competition abounds in our own community, we continue to be recognized almost every year since we opened in 1997 as the company with “the best Specialty Coffee” in Humboldt County. Additionally, in 2005, we were awarded Outstanding Customer Service by the Eureka City Chamber of Commerce, which is one of our proudest accomplishments to date. As the Jitter Bean Coffee Company has grown and developed, we have become well known for providing outstanding products. Besides offering high-quality hot drinks such as Mochas and Lattes, we work diligently to satisfy every customer by “customizing” drinks to their own taste preferences. We are able to do this by carrying more than 50 different flavors, including numerous sugar-free flavors. We also offer a delicious line of iced and blended drinks. The “Explosions,” a drink made up of ice cream, ice, espresso, and flavors, has proven to be incredibly popular among customers, especially on the “occasional” warm, sunny days in Humboldt County. Additionally, we value doing business locally when possible, therefore we are proud to serve our pastries from Royal Cookie Company, Dons Donuts, and Los Bagels. We also believe a key to our success has been the outstanding employees that we employ at the Jitter Bean. Because this is at the heartbeat of who we are to the community, we are extremely selective in choosing employees who will not only produce exceptional products and service, but also those individuals who will contribute to the positive work environment we have labored to create. We have strived to make The Jitter Bean Coffee Company a place where employees enjoy working and are well taken care of, both professionally and personally. We consider the staff of The Jitter Bean Coffee Company to be “family” and we do everything we can to cultivate that attitude and environment throughout our business.